Learn about Half Moon Bay? Best hikes around San Jose. Opens in a new window. Where to find Half Moon Bay hotels near an airport? 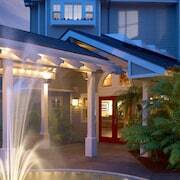 Where can I find hotels in Half Moon Bay that are near tourist attractions? 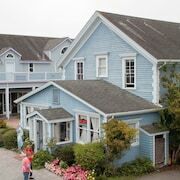 You will find a wide range of places to stay to select from when planning your vacation in Half Moon Bay. 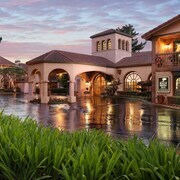 At the moment, Expedia's extensive database lists 16 hotels within easy driving distance of Half Moon Bay's center. Experienced travelers who fully appreciate the convenience of staying close to the bright lights and action of the city's heart will love the Mill Rose Inn and Zaballa House, which are within 1 kilometre (0.6 miles) of Half Moon Bay's downtown area. 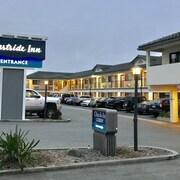 Cheaper hotel options within the Half Moon Bay region include the Half Moon Bay Lodge, Comfort Inn Half Moon Bay and Zaballa House. The The Ritz-Carlton, Half Moon Bay is positioned 3 kilometres (2 miles) from the heart of Half Moon Bay. Another option is the Rosewood Sand Hill, which is positioned 20 kilometres (12 miles) away. Two other Expedia-listed alternatives worth looking into are the The Westin Palo Alto and the Stanford Park Hotel. Once you have explored Half Moon Bay, why not explore a little more of the region? The Northern California area has many things to offer. Investigate Northern California's art museums and also enjoy its mountains and valleys. In this section of United States of America visitors can also try their hand at snowboarding. Downtown San Francisco is 35 kilometres (22 miles) to the north of Half Moon Bay and is where you'll find Sun Terrace and Bohemian Club. Should you wish to spend a night or two in Downtown San Francisco, check out the room rates at the Fairmont Heritage Place, Ghirardelli Square and The St. Regis San Francisco. 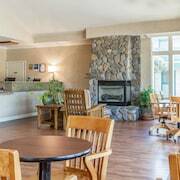 Alternatively, you could consider staying at Ocean Beach, 35 kilometres (20 miles) to the north of Half Moon Bay, where you'll find the Rodeway Inn and Suites and Beach Motel. Should you choose to stay in Ocean Beach, a couple of places to add to your itinerary are the Cliff House and Queen Wilhelmina Garden. If you are flying into or out of San Francisco International Airport and plan to stay nearby try Staybridge Suites San Francisco Airport or San Francisco Airport Marriott Waterfront. What are the most popular Half Moon Bay hotels? Are there hotels in other cities near Half Moon Bay? 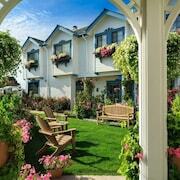 What other types of accommodations are available in Half Moon Bay? Explore Half Moon Bay with Expedia.ca’s Travel Guides to find the best flights, cars, holiday packages and more!